Generalmajor at the age of 41, this young and brilliant officer of the armored troops, drawn from the ranks of the police, commanded 7 Pz. Div. in 1944. He was killed on the Russian front in January 1944. 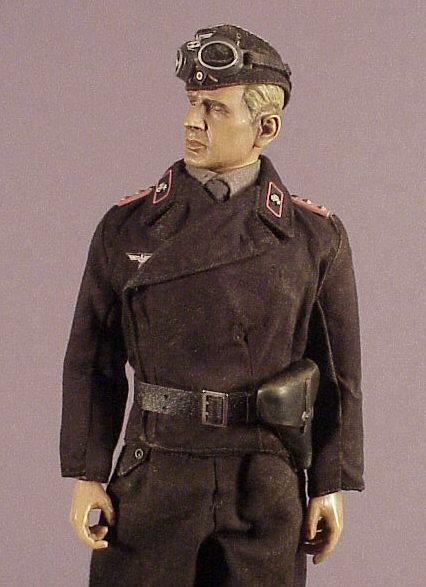 Adalbert Schulz enrolled in Berlin police force and reaches the rank of leutenant in 1934. 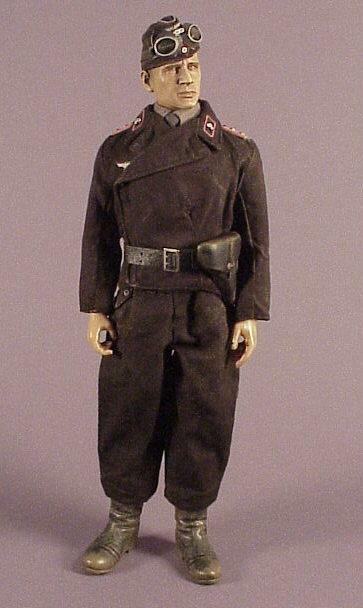 As Hauptmann he takes command of a company of 25.Pz Rgt of the 7.Pz Div in 1938 serving under Rommel. During the attacks on the west in 1940 he and his unit fights brilliantly in capturing the Saumont Forrest. 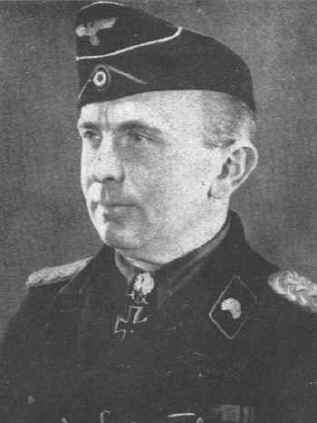 Oberst Rothenberg PzRgt Comanding officer recommends Hauptmann Schulz for the Iron Cross 1st and Second class and the Knights Cross. 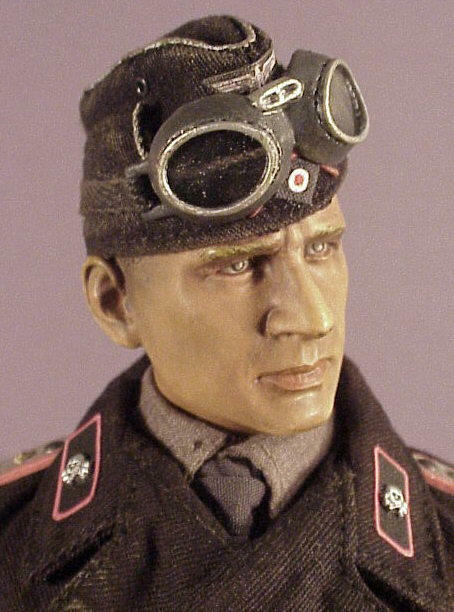 In June 22 of 1941 he leads his battalion, I./25.Pz Rgt Gespensterdivision, in the attack on Russia as part of Operation Barbarossa. Schulz earned the Oakleaves to his Knights Cross in 12/31/1941. After continued battles in 1942 the division is sent to France for refitting. Back in action in early 1943 the 25.PzRgt participated in the actions around Kharkov. Schulz, with the assistance of the some panzer remaining of Pz Rgt 25, fought against groups of armoured Soviet tanks. The Gespensterdivision destroys more than 100 enemy tanks with the destruction of armoured Brigades Soviet and several units of artillery. Schulz is promoted Oberstleutnant on 4/1/1943. In the summer of 1943, the 25 Pz Rgt participated in the tank battles as part of Operation Zitadelle in the Kursk area. or the actions in the of Bjelgorod, Dorogobushino, Scheino and Prochorowka. In November, the division launched a successful counter-attack on Kiev, close to Schitomir. At the time of intense combat, more than 200 Russian tanks are destroyed in only 12 hours! Schulz is promoted to Colonel(Oberst) on November 1 of 1943. For these successes as well as its remarkable performances in the direction of its regiment, Schulz becomes the 12/14/1943 the 9th soldier and the 2nd Heeres offizier - after Erwin Rommel - to receive the diamonds to his Knight’s Cross! He was promoted to Genaralmajor in 1/1/1944 and given command of the. In a bitter attack at Schepetowka, Gen Schulz known as Panzer-Schulz to the men in his command, was mortally wounded. He was in his command vehicle at the front of the fighting whan a shell fragment hit him in the head. Attempts were made to evacuate him to the field hospital, but it was too late. The rather obscure but brave Panzer commander served as an inspiration to his men as well as death. He died on January 28, 1944. 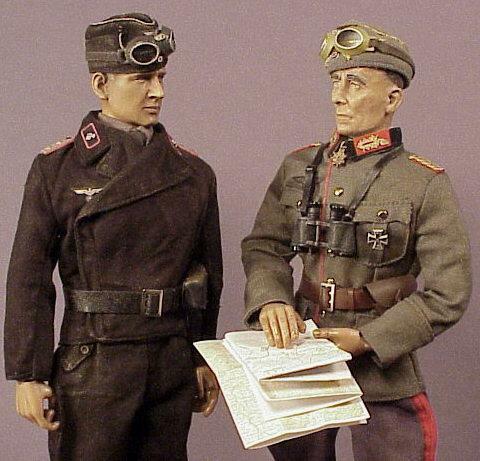 Shown on the right is Schulz as a Company Commander of the 25PzRgt with the commanding officer of the 7PzDiv, the legendary General Erwin Rommel. Who would have thought, at this time, that these two men would be the first two Heer officers to win the Knights Cross with Oakleaves, Swords AND Diamonds. Two of only 27 men to receive this decoration! 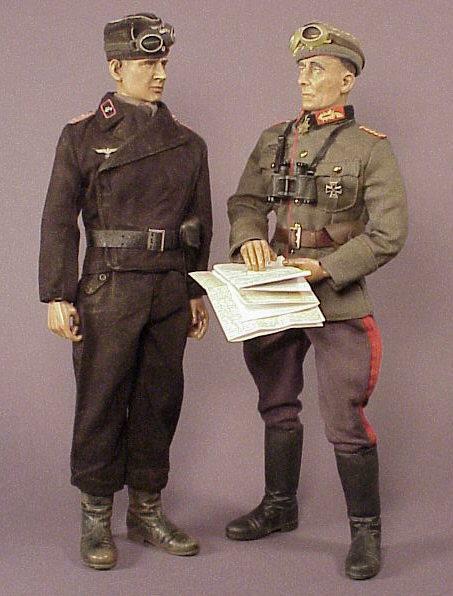 This is the first of a series of six bashes of Adalbert Schulz from 1940 as company commander in the 25PzRgt of the 7PzDiv under Rommel, to commanding odfficer of the division in early 1940. Wrap is from Viktor dyed black with RIT dye. Sidecap is from Marius with officer trim added and CVI insignia. The officer braid is string from the parts box(came from majormidnite winter trousers). I added the soutache, it is bbi dogtag string, painted pink. 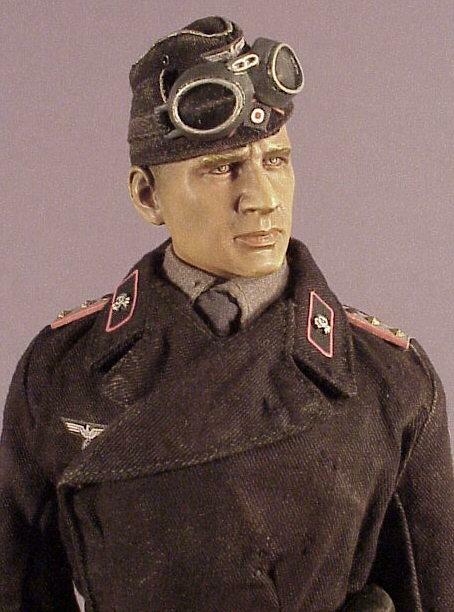 Shoulderboards are regular DML and panzer collar tabs are from CVI. Chack out other Adalbert Schulz bashes in Winkflash Albums.